My mother-in-law and I talked together many Sundays the year before she passed away in 2015. Instead of “Tuesdays with Morrie”, think “Sundays with Maria”. She told me all about her colorful life and her experiences before, during, and after World War II. Maria grew up in Siberia, Russia. I loved hearing all her stories. When she described her early childhood, her eyes lit up. She talked about how exciting it was when spring arrived. She said it seemed back then that there was a clear delineation of the seasons. To her, it felt like one day, it just stopped being winter. Then, you could hear the ice melting, the birds chirping, and see the little snowdrops beginning to pop up everywhere. I was thinking of her today when I saw my own snowdrops and crocuses popping up through the mud. Spring is a season of hope, anticipation, and re-birth.. Have you found yourself a little more awake, anticipatory, enthusiastic? A little of your own spring fever, perhaps? The other day, I watched an episode of Northern Exposure called “Wake up call”. It was about the arrival of spring in Cicely, Alaska; beautiful scenery. It reminded me of Maria’s description of spring in Siberia. The show featured all the quirky ways spring fever affected the characters in the show. It also featured a special guest appearance by a very handsome grizzly bear coming out of hibernation. That night I dreamed about that bear, or a bear…not sure. The next morning, I looked through my animal cards to see what native american magic the bear card holds. 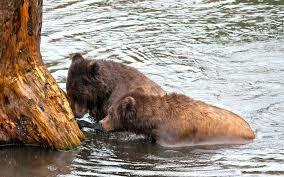 I found that the Bear totem represents strength and being in touch with the cycles of nature. It knows there is a time to stand up, be courageous, and deal with adversity and there is a time to go inward, rest and hibernate. According to the card from my deck, “Bear enters the womb-cave to hibernate so they can digest the year’s experience and incubate their dreams”. From the medicine card: “Bear reminds us of the power and art of introspection. He is present to teach us about attuning to the energy of mother earth. The bear totem seeks the sweetness (honey) of life and truth. It’s medicine is about knowing that “When we quiet our minds, when we dream while sleeping, we find that we have all the answers to life’s questions inside of us”. It teaches us about nurturing our aspirations, allowing them to incubate for a time. Bear also reminds us when the time has come to stand up for your values and beliefs and reclaim your power of knowing. It’s medicine is about recognizing that you have the inner resources to stand on your own two feet. Create your health by connecting with Bear Medicine. Take time to go within. Begin paying attention to your dreams. Recognize when it’s time to stand up for your beliefs and values. Remember, you have the inner resources to manifest that which you dream about.